Transcript of a short interview with Walter Mayer, a member of the German youth anti-Nazi organisation, the Edelweiss Pirates. As a youth, Walter questioned the German superiority and anti-Semitism he was taught. His father, an anti-Nazi, refused to allow Walter to enter one of the Adolf Hitler Schools, but did permit him to join the Hitler Youth. However, Walter's rebellious streak led him to hide a Jewish friend in his basement. He also formed a gang that played pranks on young Nazis and helped French prisoners of war. 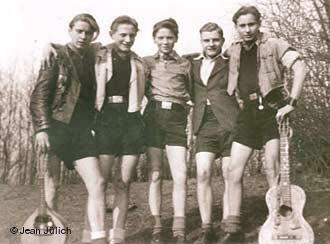 They called themselves Edelweiss Pirates (as did other groups of opposition youth in Germany). In 1943 Walter was caught taking shoes from a bombed-out store, arrested, and imprisoned. He was eventually deported to the Ravensbrueck concentration camp, where he was forced to work in the stone quarry. In 1945, Walter contracted tuberculosis and decided to escape before he was killed. Under cover of heavy fog, he reached a farmhouse. The farmer gave him his son's army uniform and helped him board a train home to Duesseldorf. Walter recovered after hospitalisation, and later moved to the United States. 'We had, uh, meetings generally, at least, well, generally at a cafe on Kings Avenue, which is - in Germany there are a number of streets which are well known like Fifth Avenue. Well Kings Avenue in Duesseldorf is one of the best known avenues in the world. It's gorgeous, wide, and has a river in the middle and all chestnut trees and so on. Well there was a cafe and in the back of the cafe was a pool room. Uh, we used to play pool, and we had our little meetings there and one would say, "We have a new member," and, uh, we would ask him questions, test him, and "Why do you like to join us?" and, you know, wanted to have some assurance. And, and, uh, then we, we pro..."What are we going to do next?" and maybe one would say, "You know, the Hitler Youths, they all, uh, store their, uh, equipment at such-and-such a place. Let's make it disappear." "Okay, when are we going to meet?" Such-and-such a time. And that's what we did. It became, uh, it came to the point where we became enemies and people began to look for us because we went a little too drastic, we, you know we started maybe by deflating the tires, then we made the whole bicycle disappear, so it came to the point where too many complaints.